Or, maybe a chain saw, or some elected idiots that actually understand the problem, are willing to deal with it, and will go to the mat to make some semblance of addressing the problems. I can hardly stand any of them, and the system is fooked, but I always hope. While we are all busy shopping, buying, spending and trying to get 'the econ' back in shape, (Consumer spending is ~60%+ of the US GDP), here is a little 'balance sheet' done in numbers most of us understand. Even for the over spenders, one would admit few run a household like the Fed gov't does. Looks like the budget from hell, right? This household with its skyrocketing debt stands precariously on the brink of bad credit, bankruptcy, and ruin. Now add 8 zeros to all of the above numbers, and you have the current U.S. federal budget (World Magazine, May 19, 2012). My question is what's going to happen when this house of cards collapses? The problem is that we support tons of other countries. It's the classic "too big to fail". But the way we are going, we will fail. If the US fails, so will other countries. Especially china, who really is in a bad situation now too. Textiles are being sent to Vietnam and Cambodia. Chinas manufacturing days are near the end. Hope this makes sense, I have a few beers in me lol. After 25 years of covering the federal budget, I'm still amazed at the persistence of fiscal misconceptions. The distinction between fact and political opinion has been blurred to the point of invisibility. The choices—what spending to cut, whose taxes to raise—are fundamentally political; the facts are not. But the budget is now so sprawling—the U.S. government spent $400 million an hour last year—that grasping it in its entirety is impossible. The budget, I've concluded, is best understood in digestible morsels. Nearly two-thirds of annual federal spending goes out the door without any vote by Congress. About 63% of the budget is on autopilot. Congress passes legislation every year to keep the government operating, the phones answered and the National Parks open, but much of the money the government spends doesn't require any affirmative vote. Social Security benefits get deposited. Health-care bills for Medicare for the elderly and Medicaid for the poor are paid. Food stamps are issued. Farm-subsidy checks are written. Interest payments are dutifully made to holders of Treasury bonds. Congress can alter these programs, but if it does nothing, the money is spent. As Eugene Steuerle, an economist at the Urban Institute think tank in Washington, puts it: "In 2009, for the first time in the nation's history, every dollar of revenues had been committed before Congress walked in the door." The government's total take was only enough to pay for promises that had been made in the past—interest, Social Security, Medicare, Medicaid and so on. For everything else, the government had to borrow. The U.S. defense budget is greater than the combined defense budgets of the next 17 largest spenders. About $1 of every $5 the federal government spent in 2011 went to defense, and about 20 cents of that $1 was spent on the wars in Iraq and Afghanistan. In all, the U.S. spends about $700 billion a year on its military. That's more than the combined military budgets of China, the U.K., France, Russia, Japan, Saudi Arabia, Germany, India, Italy, Brazil, South Korea, Australia, Canada, Turkey, the United Arab Emirates, Spain and Israel. The Pentagon counters that the U.S. also asks its military to do more than all those other countries combined—to keep sea lanes open for international trade, for instance, and to be prepared to deploy almost anywhere. About $1 of every $4 the federal government spends goes to health care today. That is rising inexorably. In 1981, spending on Medicare for the elderly and disabled and Medicaid for the poor accounted for 9.5% of federal outlays besides interest. By 2011, the two programs were consuming nearly 25%. In 2021, if current policies remain in place, government spending on health care will consume 33%, according to the Congressional Budget Office, even if the Affordable Care Act survives Republican attacks. The Medicare prescription-drug benefit alone will cost the government more over time than the wars in Afghanistan and Iraq. The war spending will end someday; the drug benefit is permanent. Firing every federal government employee wouldn't save enough to cut the deficit in half. The federal government spent $435 billion last year in wages and benefits for its 4.4 million employees, about 35% of whom are uniformed military personnel and another 29%of whom are civilians working in the departments of Defense, Veterans Affairs and Homeland Security. Eliminating the federal workforce entirely would have saved a lot of money, of course, but it would have pared last year's deficit by only one-third. So where does all the money go? A lot of what government does is siphoning money from some and giving it to others, or occasionally to the same people. About $2.3 trillion, two-thirds of all federal spending last year, went to benefits of some sort for individuals: Social Security, Medicare, Medicaid, food stamps. Another $220 billion went for grants to state and local governments for everything from schools in poor neighborhoods to sewage-treatment plants. The share of income most American families pay in federal taxes has been falling for more than 30 years. There are a dozen ways to measure the slice of income that the government takes in taxes, and most point in the same direction. One meaningful metric: The CBO estimates that for families in the very middle of the middle class, the federal government took an average of 19.2% of their income before deductions in 1981 in income, payroll and all other federal taxes. State and local taxes have risen for many, but the federal tax bite has eased. In 2007, just before the recession hit, the CBO estimates that the tax take for Americans was 14.3%—and it has fallen since to 12.4% in 2011, according to the nonpartisan Tax Policy Center. 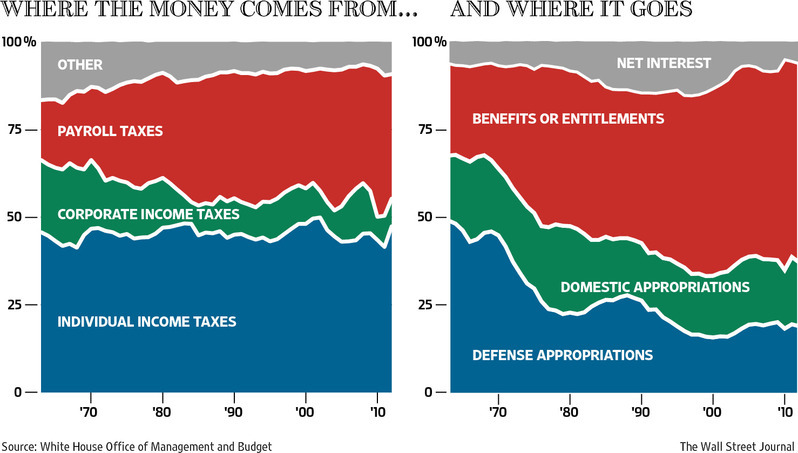 Nearly half of American households—46%—didn't pay any federal income taxes at all in 2011. The vast majority of them didn't make enough money to owe taxes, or they took advantage of tax breaks that Congress has created. About half of those who didn't owe federal income taxes were hit by payroll taxes levied on wages to finance Social Security and Medicare. The federal government borrowed 36 cents of every dollar it spent last year, but had no trouble raising the money. Even though the red ink is flowing now at a rate of $1.2 trillion a year, the U.S. Treasury is borrowing at interest rates lower than at any time in at least half a century. But the government still paid $230 billion in interest last year. That's more than triple the $64 billion it spent on all research and development outside of defense, from the National Institutes of Health to the National Aeronautics and Space Administration. When interest rates return to normal, as they surely will someday, each additional $1 trillion in debt will add about $50 billion a year to U.S. annual interest payments, money that won't be available for spending on other things. This truly is unsustainable. The U.S. today is in the postdenial phase of coping with deficits, the ones that will persist even after the economy regains its health. No one of consequence in Washington argues that deficits don't matter. Deciding what to do about them is contentious because it's about apportioning the pain. Getting the facts straight is a necessary first step. site won't provide for editing much/at all after posting, these days. Interesting how the funding from corporate income taxes is decreasing at an increasing pace. Some countries have more corporate than individual taxes. and they honestly don't believe or understand that their going down with it.